Lego blocks and role playing do not appear to have much to do with teaching allied health students, however a CSU academic has won a national teaching excellence award for her creative approach to learning. At first glance, Lego blocks and role playing do not appear to have much to do with teaching allied health students, however a Charles Sturt University (CSU) academic has won a national teaching excellence award for her creative approach to learning. 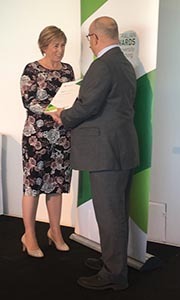 Dr Louise Pemberton (pictured left being presented her award) from the School of Community Health at CSU in Albury-Wodonga has been awarded a Citation for Outstanding Contributions to Student Learning at the annual Australian Awards for University Teaching. She's been recognised for her creative learning activities in teaching difficult biomedical sciences subjects to students studying physiotherapy, podiatry, occupational therapy, health and rehabilitation science and speech and language pathology at CSU. 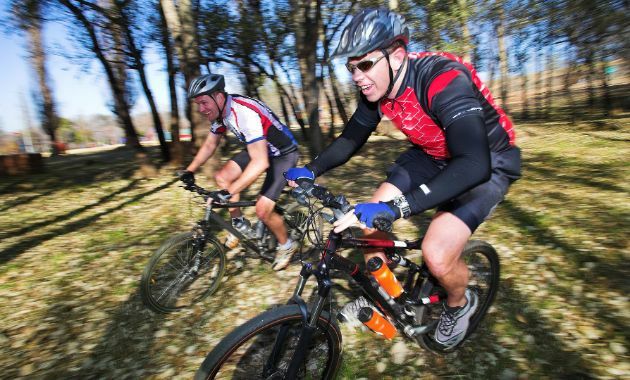 "When I began lecturing in 2012, I delivered my classes in the conventional manner, standing in front of the class explaining physiological mechanisms as they're written in textbooks," Dr Pemberton said. "However I quickly noticed a drop in class attendance. The final exam marks and student feedback clearly showed that there were problems with my students' engagement with content and a perception that biomedical science subjects were too difficult." Dr Pemberton then designed fun and interactive learning activities to teach, engage and inspire the students, such as role playing where each character in the play is aligned with a molecule. In addition, the CSU academic used Lego blocks to demonstrate various interactions between prescription drugs. "I found that when I 'switched' between conventional teaching and the interactive games, the exam results improved and the feedback from students was positive." 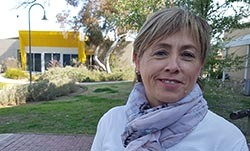 In addition, Dr Pemberton found her academic colleagues were keen to embrace the innovative technique and have adopted her approach to learning. "I am driven by my philosophy that all students can succeed in the biomedical science subjects if I provide a structured learning environment which is rich with innovative learning to stimulate curiosity." Accompanied by CSU Vice-Chancellor Professor Andrew Vann, Dr Pemberton received the Citation during a ceremony in Sydney at the Museum of Contemporary Art in Sydney on Thursday 14 September. Professor Vann said, "Dr Pemberton is to be congratulated for her innovative approach to learning which engages and motivates our allied health students. "She is truly playing her role in bringing Charles Sturt University's values of inspiring and impactful to life." An initiative of the federal Department of Education and Training, the Australian Awards for University Teaching celebrate and reward excellence in university teaching. Dr Louise Pemberton is a lecturer in biomedical sciences in the School of Community Health at CSU in Albury-Wodonga. She is available for interview through CSU Media.